In today’s fast-paced, demanding business world, it’s more important than ever for teams to be high performing. While the importance of having high performing teams isn’t new, what has changed in just a few years’ time is the definition of a high performing team. Teams today must work at the speed of change, manage frequent disruption, and try to stay ahead of the pace of advancing technology. The challenge is that this is hard. Team failures are costly, and it is rarely external forces that create the impediment. 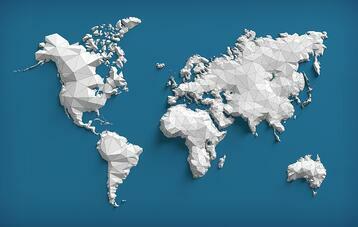 This is where the Bates LTPI™ (Leadership Team Performance Index) comes in. Our assessment provides teams and their leaders keen insights into essential behaviors that typify today’s high performing teams. This new model and assessment draw on the latest research on global teams as well as tried and true, proven tenets of great team performance. Building on the expertise and data-driven insights gained through implementing our Bates Executive Presence Index (ExPITM) for 4 years, together with the latest global research on teams, the LTPI™ delivers a unique and revolutionary way to shine a light on the team’s collective strengths and gaps, in real time, with the goal of interpreting that data in context with the team’s mission, goals and business challenges. 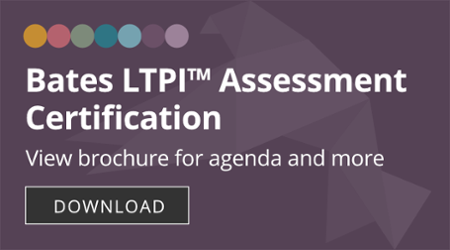 What Will You Learn in Bates LTPI™ Assessment Certification? The Bates LTPITM Assessment Certification program provides talent and organizational development leaders and consultants with the opportunity to explore and appreciate the uniqueness of the Bates LTPITM assessment and the reliable Bates process of ensuring that the data translates into insights and actionable feedback for the team and its leader. Whether you attend an in-person program or a virtual program that combines self-study and live virtual sessions, you will gain confidence and competence in administering the Bates LTPITM. In addition to learning the Bates Leadership Team Performance Index model, you’ll get hands-on practice in analyzing and interpreting LTPITM data as well as opportunities to work in small groups to prepare for powerful debrief meetings with clients. Is Bates LTPI™ Assessment Certification for you? The Bates LTPI™ is for talent and organizational development leaders and consultants who want to bring fresh insights to their work, whether internal or external to the company, to help drive growth, innovation and critical business outcomes. The course also gives you a chance to meet and interact with highly qualified, seasoned professionals who are joining our growing, global community of practice to share ideas and learn about new research. Why Choose Bates LTPI™ Assessment Certification? The Bates LTPI™ Assessment Certification program provides practitioners with the opportunity to learn to use the Bates LTPITM, a unique perspective and way to measure the leading edge essential qualities to high performing teams today, in the context of the team’s business challenges and strategic goals. Participants have the opportunity to incorporate innovation into their work and differentiate their practices to bring value to leaders and their teams in a powerful new way, based on measurement that matters. Bates is an innovator in leader development, launching the first-and-only research-based, scientifically validated multi-rater assessment that measures a leader’s executive presence and influence, and the new, state-ot-the-art assessment for team performance. Our seasoned facilitators have used the Bates ExPI™ and LTPITM to help senior leaders at the world’s leading companies in over 40 countries accelerate their strategic agendas, deliver bottom line results more effectively, and enable innovation and new business model creation. Our deep expertise in communicative leadership sets us apart and allows us to help individuals, teams and organizations move where they need to go. Programs are led by seasoned organization and team development experts who were involved in the creation of the Bates LTPITM assessment and model. Our facilitators have extensive track records of helping senior leaders and their teams excel and deliver breakthrough performance. They strive to create a great learning environment for the senior level practitioner who is looking for ways to grow, innovate, and deliver value and impact.